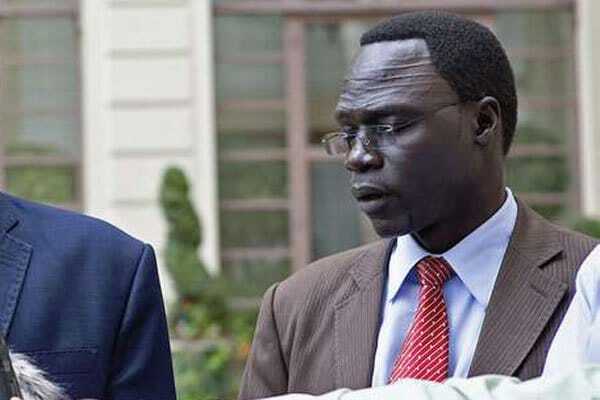 The spokesman for South Sudan’s opposition leader James Gatdet Dak has accused Kenyan authorities of taking part in his alleged kidnapping, deportation to his home country and death sentence. Speaking to The Associated Press, Dak said that high-level Kenyan authorities collaborated with South Sudan government to seize him from his Nairobi home in November 2016. Dak, one of the highest-profile detainees during South Sudan’s five-year civil war, further stated that after his seizure, he was forced onto a plane for deportation to a country where he feared for his life. Narrating what has already been shared shared with a United Nations commission of inquiry, Dak also revealed that while at a detention facility near the Nairobi airport, a high ranking Kenyan police officer informed him that there had been a deal between the presidents of Kenya and South Sudan. “There’s no way they’re going to help you,” Dak recounts being told by the officer. Being one of the most trusted counterparts of opposition leader Riek Machar, Dak fled to Kenya shortly after the war began in 2013. He further divulged that Kenyan authorities told him he was being deported because of his statement that supported the dismissal of the Kenyan force commander for South Sudan’s U.N. peacekeeping mission. However, he recalls resisting to board the plane to South Sudan, while asking a flight attendant to help him. “(I told her) I’m press secretary for a rebel leader who’s fighting that government and these people are kidnapping me,” he notes. Despite his pleas, she prevented him from leaving, he added that the Kenyan national security officers forced him onto an afternoon flight warning that if he struggled he’d be handcuffed and carried on-board. Additionally, he asserted that Machar’s calls for assistance to Kenya’s deputy president and attorney general were futile. However, despite the allegations, Kenya’s government spokesman, Eric Kiraithe, would not comment on Dak’s case, reiterating that Kenya is committed to making sure “peace was accelerated” in its neighbor. The South Sudan government denied any associations with the Kenyan government on the issue. Upon his arrival in S. Sudan, Dak was detained for fueling the conflict with a Facebook post he made when fresh fighting broke out in the capital, Juba, in July 2016. After serving a sentence of 15 months, he was later charged with treason and sentenced to death. However he was later released, two years after his kidnap in Nairobi, together with another opposition member William Endley, a South African former defense colonel, thanks to the peace deal. Machar had demanded that all political detainees be released, per the terms of the peace deal, before he would return to South Sudan. Dak is currently seeking asylum in Sweden where he is waiting ti be reunited with his family.